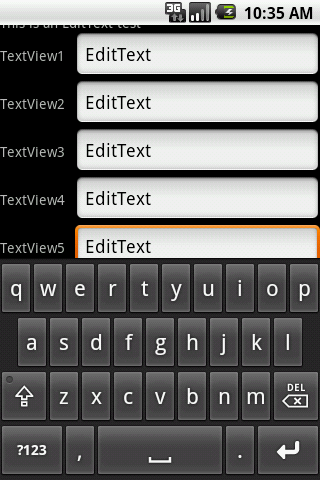 My EditText is cut off by the on-screen keyboard! With clients demanding left and right that my app should look like an iPhone app, I tend to be unappreciative of the way Android natively handles UI interactions and such. 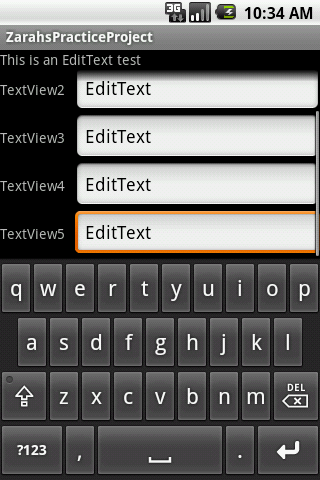 Notice how the screen automagically scrolls up when you click on an EditText? It turns out that in iPhone development, the developer does this manually (indicate how much the view should scroll when the on-screen keyboard appears, then scroll it back down afterwards). HA! But even magic fails sometimes. Has this ever happened to you? The bottommost EditText is cut off. And we don't want that! So what do we do? Do we programmatically scroll the view up? I don't want to do that! It turns out that we can just wrap the whole view in a ScrollView and it will scroll up properly!